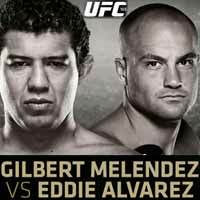 Review by AllTheBestFights.com: 2015-06-13, close fight but not so exciting: Gilbert Melendez vs Eddie Alvarez gets two stars. The black belt in Bjj and former Strikeforce Lw champion Gilbert Melendez entered this fight with a pro mma record of 22-4-0 (55% finishing rate) and he is ranked as the No.7 lightweight in the world (currently the #1 in this division is Rafael dos Anjos) but he lost two out of his last three bouts: against Benson Henderson in 2013 (=Henderson vs Melendez) and Anthony Pettis in 2014 (=Pettis vs Melendez). Between these two defeats he won over Diego Sanchez in one of the best mma fights of 2013 (=Melendez vs Sanchez). His opponent, the former Bellator Lw champion Eddie Alvarez, has a record of 25-4-0 (84% finishing rate) and he entered as the No.12 in the same weight class. He fought just once in 2014 losing to Donald Cerrone (=Cerrone vs Alvarez). Melendez vs Alvarez is on the undercard of Cain Velasquez vs Fabricio Werdum – UFC 188. Watch the video and rate this fight!